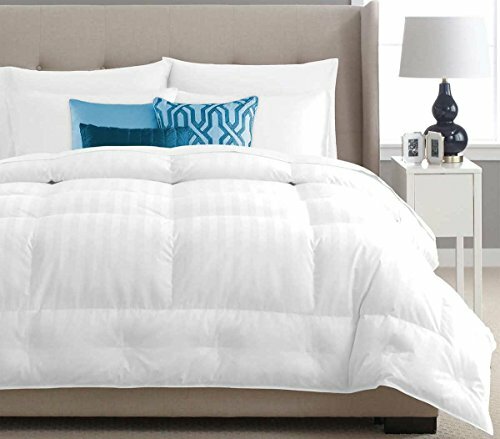 You will want to dive into bed every night to snuggle with your Pacific Coast® European Down Comforter. Experience the ultimate luxury of crisp premium cotton in a stripe pattern that is woven to the highest Barrier Weave® down-proof standards. The European down has been selected for its exceptional fluff and durability. And, the True Baffle Box construction is designed to allow the down to maintain its loft while the Comfort Lock® border keeps the down on top of bed, just where you want it. Warranty 10-Year Limited Warranty: Pacific Coast® has followed a tradition of European quality and craftsmanship for over a century. Such long-standing expertise means you can depend on Pacific Coast® to provide reliable comfort and lasting durability. If any material defects are found, simply return the comforter for a refund. Specifications Sizes:90" x 98"
650 Fill Power Hyperclean® Pacific Coast Down, Full/Queen: 90"x98"
If you have any questions about this product by Pacific Coast, contact us by completing and submitting the form below. If you are looking for a specif part number, please include it with your message.